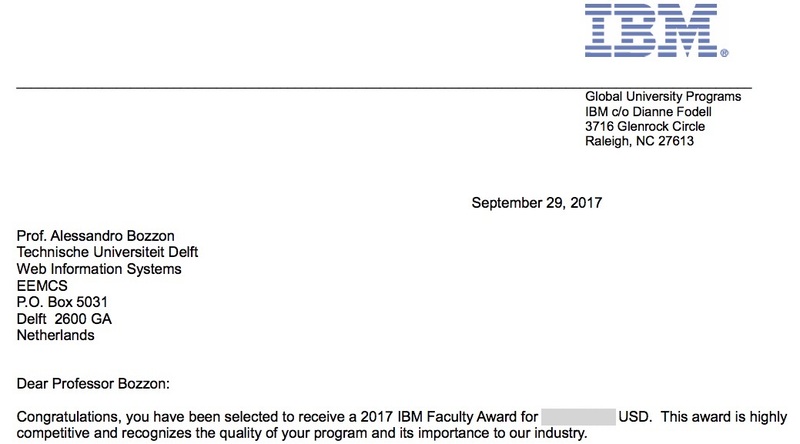 Alessandro Bozzon has been selected for the IBM Faculty Award, which is a competitive worldwide program intended to foster collaboration between researchers at leading universities worldwide and those in IBM research. Alessandro Bozzon received the award in the section Cognitive Computing and IoT for his work on Enterprise Crowdsourcing performed in collaboration with the IBM Benelux Center for Advanced Studies. To qualify for this internationally competitive award, the nominee must be a full-time professor at an accredited university that has a Ph.D. or MBA program in the nominee’s field. Candidates must have an outstanding reputation for contributions in their field or, in the case of junior faculty, show unusual promise.